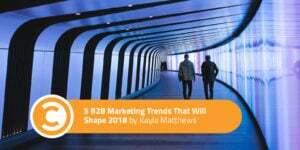 B2B marketing values relevancy, which makes emerging trends pertinent for any marketer looking to get a jump on their effectiveness in 2018. From embracing multimedia content creation to using copywriting in a more story-driven, personal form, these marketing trends are something all B2B marketers should keep in mind. Blog posts are fine for informational reference, but there’s demand for multimedia content, especially video. In fact, on today’s multimedia-driven web, people spend more time with digital video than social media. The podcast audience also continues to expand. The message is clear: Audiences are becoming more familiar with visual and auditory forms of content, instead of traditional copy. In 2018, B2B marketing looks to involve more multimedia content to engage business-to-business leads. Live video is another exciting aspect of multimedia content. B2B marketing relies strongly on at least one party demonstrating desirable expertise, and one excellent way to showcase expertise is live video. In fact, a Livestream study found 80 percent of brand audiences would prefer to watch a live video instead of reading a blog post. Hosting videos on Facebook Live, while taking and answering questions, is a fantastic way to showcase expertise to potential B2B partners and the general viewing audience alike. It’s easy enough to have a professional-looking website in 2018, but be prepared for your audience to demand more. It’s already essential for brands to have a mobile-friendly website, considering that 69 percent of digital media engagement is on mobile platforms—a number that will only increase in 2018. In fact, mobile is steadily surpassing the web as the go-to platform. As a result, B2B marketing will likely embrace mobile formats in the future and beyond. These range from mobile-friendly website and email template designs to mobile apps that enhance the brand experience. The virtual and augmented reality industries are rising quickly. Industries from fashion to B2B marketing are embracing these new technologies. In 2018, B2B marketers will continue to explore ways to engage audiences with virtual and augmented reality. We’re just now seeing the impact of VR and AR on B2B marketing engagement ideas, including putting customers in a virtual product simulation and using a “virtual space” where marketers can address questions, as if they’re in the same room with the viewer. It’s a form of futuristic webinar, and it’s effective: Research from Stanford shows virtual reality simulations can be effective motivators for buying behavior. While you should certainly be doing your part to attract leads to your businesses naturally, there are also resources out there that can provide B2B leads directly to you. You can set demographics like industry, number of employees, and business revenue to hone in on a demographic that is most likely to be in need of your product or service. For small businesses, especially, which may lack the time and resources to uncover a multitude of leads on their own, automating business leads can be ideal. The efficiency of business lead automation makes it a likely trend for business in 2018 and beyond. Consider marketing automation software. In surveys of marketing automation software users, the users highlight the usefulness of marketing automation software in increasing leads and accurately measuring results. Use mail merging software to automate email send-outs and follow-ups, with automated tracking capabilities on a spreadsheet via Google Drive. Mail merging enables users to personalize emails, like a contact’s name and publication, drawing from information on a spreadsheet of contacts. Compile key information about leads with forms and surveys. To incentivize survey participation, offer a discount or prize to someone within the pool who participates. Base the survey questions around information relevant to the business’ target demographic. There are a variety of influencers across social media that drive purchasing decisions for their high number of followers. Although B2C brands tend to dominate influencer social media channels, there are also business-oriented influencers, on YouTube in particular, that reach audiences in the B2B sphere. Look for B2B marketers in 2018 and beyond to embrace influencers just as advertisers have, using their platform as a way to engage a relevant audience quickly. 2018 is an exciting time for B2B marketing, with a wide variety of exciting new ways to market with relevancy and technological savvy.